On Wednesday December 4th marks Day 1 of the BIOMEDevice trade show in San Jose. Doug and Paul will be available to field your questions about the Reaction Injection Molding (RIM) process. While you are there discuss the concept ideas you may have on your radar. They may be able to discern quickly if the RIM process will be well suited for this low volume molding process. Paul and Doug both have years of expertise in working with this low pressure and low temperature molding process. Ask about the ” design generosity “of this process. 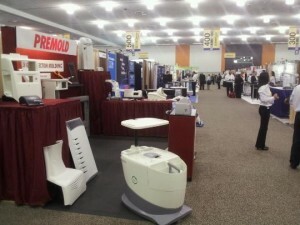 BIOMEDevice trade show in San Jose CA – features Reaction Injection Molded (RIM) polyurethane plastic parts (Thermoset).